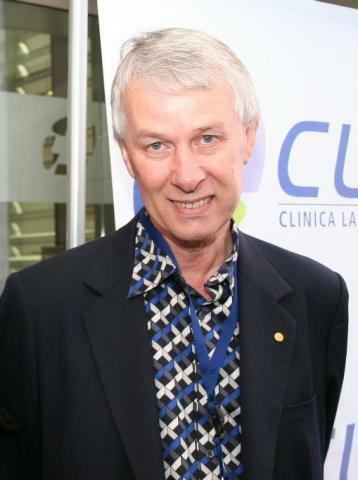 Sir Richard J. Roberts is one of our Laureates-in-Residence. Richard J. Roberts was born in 1943, the only child of John and Edna Roberts (née Allsop) in Derby, England. My father was a motor mechanic and my mother a homemaker. We moved to Bath when I was four and so I consider myself a Bathonian. My elementary education was at Christ Church infant school and St. Stephen’s junior school. At St. Stephen’s I encountered my first real mentor, the headmaster Mr. Broakes. He must have spotted something unusual in me for he spent lots of time encouraging my interest in mathematics. He would produce problems and puzzles for me to solve and I still enjoy the challenge of crossword and logical puzzles. Most importantly, I learned that logic and mathematics are fun! After passing the “dreaded” 11 + exam I moved on to the City of Bath Boys (now Beechen Cliff) School. At this time I wanted to be a detective, where it seemed they paid you to solve puzzles. This changed quickly when I received a chemistry set as a present. I soon exhausted the experiments that came with the set and started reading about less mundane ones. More interesting apparatus like Bunsen burners, retorts, flasks and beakers were purchased. My father, ever supportive of my endeavors, arranged for the construction of a large chemistry cabinet complete with a formica top, drawers, cupboards and shelves. This was to be my pride and joy for many years. Through my father, I met a local pharmacist who became a source of chemicals that were not in the toy stores. I soon discovered fireworks and other concoctions. Luckily, I survived those years with no serious injuries or burns. I knew I had to be a chemist. I am a passionate reader, having been tutored very early by my mother. I avidly devoured all books on chemistry that I could find. Formal chemistry at school seemed boring by comparison and my performance was routine. In contrast, I did spectacularly well in mathematics and sailed through classes and exams with ease. During these years at school I also discovered chess, which I loved, and billiards and snooker, which became a consuming passion. At age 15, I easily passed the O-level examinations and then began to specialize in the sciences taking Mathematics, Physics and Chemistry. For exercise I discovered the sport of caving and would spend most weekends underground on the nearby Mendips. From age 16 on I found school boring and failed A-level Physics at my first attempt. This was necessary for University entrance and so I stayed an extra year to repeat it. This time I did splendidly and was admitted to Sheffield University, my first choice because of their excellent Chemistry Department. After Chemistry, Physics and Mathematics in the first year, I opted for Biochemistry as a subsidiary subject in the second year. I loathed it. The lectures merely required rote learning and the laboratory consisted of the most dull experiments imaginable. I was grateful when that year was over and could concentrate wholly on Chemistry. I graduated in 1965 with an upper second class honours degree. As an undergraduate, David Ollis, the Professor of Organic Chemistry, really caught my imagination. His course emphasized problem solving, not memorization – more puzzles! Fortunately, he accepted me as his Ph.D. student and I began to explore the neoflavonoids found in a piece of heartwood from a Brazilian tree. Two pieces of luck followed. My tree contained more than its fair share of interesting new compounds and I was put in a lab with an exceptional postdoctoral fellow, Kazu Kurosawa, who proved a gifted teacher. Not only did he suggest the right experiments he explained why they should be done. Within one year I had essentially enough for my thesis and an understanding of how to do research. I had the luxury of spending the next two years following my nose, reading and experimenting. During this time I came across a book, by John Kendrew, that was to change the course of my research career. It described the early history of crystallography and molecular biology focussing on the MRC Laboratory in Cambridge. It was my first exposure to “molecular biology” and I became hooked. For postdoctoral studies, I looked for a laboratory doing biochemistry that might accept an organic chemist and provide a pathway into molecular biology. Luckily, Jack Strominger offered me a position, not in Wisconsin as I had thought, but at Harvard where he had just been appointed Professor of Biochemistry and Molecular Biology. It was on January 1st, 1969, that my family walked across the runway at Logan Airport with an outside temperature of 4°F and a massive wind blowing, to start a new life. The next four years were wonderful. Mostly, I learned, although at first I was in a fog. Everyone spoke in acronyms: DNA, RNA, ATP, UDP, GlcNAc. Luckily two Australians, Aubrey Egan and Allen Warth, lived close to my apartment and we would drive in and out of the lab together each day. Those half hour commutes became my biochemistry classroom. Slowly I learned the jargon. A third Australian, Tom Stewart patiently guided me into the world of tRNAs since it was his project that I was to pick up. I was assigned the job of sequencing a tRNA that was involved in bacterial cell wall biosynthesis. In 1969, only a handful of tRNAs had been sequenced previously, mostly by chemical techniques introduced by Holly and his contemporaries. However, within a few months and much reading, I decided that a new method, being pioneered in Fred Sanger’s lab in Cambridge, was much better. In late 1970, I had succeeded in making enough pure tRNAGly to start sequencing and set off for a one month sojourn in Cambridge to learn the techniques. What a wonderful time! I don’t remember sleeping, but I do remember the excitement of meeting Fred and the other famous researchers, many of whom had featured in Kendrew’s book. This was a heady experience that validated my decision to be a molecular biologist. On my return to Harvard, my small sequencing operation was the first in the Boston area and many researchers came to learn the techniques. My own sequencing was successful and I managed two Nature papers during this postdoctoral period. When it came time to leave Harvard I wanted to return to the UK and applied for a job in Edinburgh. In the meantime, I was approached by Mark Ptashne, who told me that Jim Watson (“the” Watson) was looking for someone to sequence SV40. I had not met Jim previously and I was over-awed when he offered me the job after a 10 minute meeting, during which I mainly listened! It was a challenging project made all the more exciting by Jim’s description and his offer of a good salary, money to support a lab and all necessary set-up money. With a month to decide and no word from Edinburgh, I decided the offer was too good to turn down. In September, 1972, I moved to Cold Spring Harbor. Earlier in 1972, I attended a seminar at Harvard Medical School given by Dan Nathans. He described an enzyme, Endonuclease R, that could cleave DNA into specific pieces. This was to shape much of my subsequent research career. Sanger had developed RNA sequencing because there were plenty of small RNA molecules to practice on, but no suitable DNA molecules. I realized that Nathans’ restriction enzyme gave an immediate way to isolate small DNA molecules. Surely there must be more restriction enzymes with different specificities. DNA sequencing seemed within reach and I was exhilarated. Upon moving to Cold Spring Harbor, I set out to make preparations of Endonuclease R and the few other restriction enzymes known at the time. We also began a systematic search for new ones. I also made some DNA, since I had never worked with it before! A key factor in our restriction enzyme success was a highly talented technician, Phyllis Myers, who joined me in 1973. She became the keeper of our enzyme collection and a valuable resource to scientists around the world. We constantly sent samples to other researchers and were inundated with visitors. Every meeting at Cold Spring Harbor brought a few people carrying tubes of DNA to see if we had an enzyme that would cut it. Three quarters of the world’s first restriction enzymes were discovered or characterized in my laboratory. I made a lot of friends in those days! Plans to sequence SV40 DNA were abandoned shortly after reaching Cold Spring Harbor. Instead we turned our attention to Adenovirus-2 DNA. Ulf Pettersson had brought this system to the laboratory shortly before my arrival and it seemed a good model system because it was similar in size to bacteriophage lambda, where many spectacular advances in prokaryotic molecular biology had taken place. We began to map the DNA. Similar work was being carried out in Joe Sambrook’s lab at Cold Spring Harbor and eventually led to the only joint publication I have with Phil Sharp. In 1974, Richard Gelinas, whom I had first met at Harvard, joined my laboratory to characterize the initiation and termination signals for an Adenovirus-2 mRNA. The idea was to sequence the 5′-end of an mRNA, map its location on a restriction fragment, and then sequence the upstream region. This would be the promoter. Shortly after beginning the project, mRNA caps were discovered and we developed an assay for capped oligonucleotides. All seemed well until we came up with the startling finding that all late mRNAs seemed to begin with the same capped oligonucleotide, which was not encoded on the DNA next to the main body of the mRNA. We had excellent biochemical evidence for this, but real proof was elusive. In March, 1977, I hit on the right experiment to show that our proposed split structure for Adenovirus-2 mRNAs was correct. Louise Chow and Tom Broker, two talented electron microscopists, agreed to collaborate with us on the crucial experiment. We hoped to visualize the split structure by hybridizing an intact mRNA to its two different coding regions. Based on a guess about the location of the coding region for the 5′-end, we made appropriate DNA fragments. The reason for our guess turned out to be wrong, but luckily the fragment worked anyway! Finally, by direct visualization we could see the split genes in the electron microscope. Our own work turned to an analysis of the sequences involved in RNA splicing. Joe Sambrook and Walter Keller cloned the common leader sequence at the 5′-end of late Adenovirus-2 mRNAs and Sayeeda Zain in my lab sequenced it. Later we undertook the complete sequence of Adenovirus-2 DNA. This required a lot of computer software development and I was fortunate to have Richard Gelinas and Tom Gingeras spearheading this effort. In 1978, this was still a relatively new activity and not considered particularly biological. I had trouble convincing Jim Watson that computers were essential for modern biology and for several years we operated remotely through Stony Brook University. Eventually, I managed to get funding from NIH (Phil Sharp was chairman of a site-visit team that reviewed this grant) and we are still active in this area. My most recent work has been in the area of DNA methylases as outlined in the Nobel Lecture. In 1992 I moved to New England Biolabs, a small private company of 150 individuals making research reagents, most notably restriction enzymes, and carrying out basic research. In 1974 I had tried unsuccessfully to convince Jim Watson that Cold Spring Harbor should start a company to manufacture and sell restriction enzymes. He declined, thinking there was no money to be made. Soon after this I met Don Comb, the president and founder of New England Biolabs, who had a small basement operation going with himself, his wife and one technician. They were about to start selling the first restriction enzyme. I told him about our rapidly growing collection and was appointed their chief consultant. I am now joint Research Director with my good friend, Ira Schildkraut. The main theme of my work in biology has centered on the belief that we must know the structure of the molecules we work with if we are to understand how they function. This means knowing the sequence of macromolecules and cataloguing any modifications such as methylation. For proteins, 3-dimensional structure and post-translational modification are crucial. This latter area is a target for my future work. Throughout my life in science I have been fortunate to have friends and family who will bring me back to earth and remind me that there is much in life to be savored besides Science. I enjoy music very much and love to collect and play games, especially video games. I am indebted to my wife Jean, and my children, Alison, Andrew, Christopher and Amanda who have been a source of great joy and comfort. This autobiography/biography was written at the time of the award and later published in the book series Les PrixNobel/Nobel Lectures. The information is sometimes updated with an addendum submitted by the Laureate. Maaf. Terjemahan untuk artikel ini sedang diusahakan.